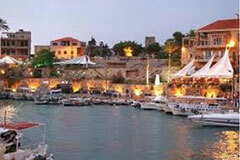 Byblos is re-emerging as an upscale touristic center. With its ancient port, Phoenician, Roman and Crusader ruins, sandy beaches and the picturesque mountains that surround it make it an ideal tourist destination. The city is known for its fish restaurants, open-air bars, and outdoor cafes. Yachts cruise into its harbor today like they did in the sixties and seventies. Byblos Port is an ancient port in Byblos, Lebanon and is believed by the Lebanese to be oldest port in the world. Around 3000 BC, Byblos Port was the most important timber shipping center in the eastern Mediterranean. It was used by the Phoenicians to ship Cedars of Lebanon and other wood to the Pharaohs of Ancient Egypt to be used in tomb construction and shipbuilding.